The family of a former policewoman accused of leaving her fingerprint at a murder scene are to end their campaign for a public inquiry into the case. Shirley McKie's father Iain said he and his daughter wanted to get on with their lives. He said they would not take part in any future public inquiry into the case. Ms McKie was cleared of perjury and received £750,000 from the Scottish Executive in an out-of-court settlement earlier this year. Ministers have rejected repeated calls to hold a public inquiry into the case of the former police officer, from Troon in Ayrshire. She was accused of perjury after insisting that she had not left a fingerprint at the scene of the murder of Marion Ross in 1997. The 44-year-old was cleared of the charge two years later. The Scottish Parliament's Justice 1 Committee launched its own inquiry into the case earlier this year. There were angry exchanges when Ms McKie gave evidence to the committee, with her accusing some MSPs of putting her on trial again. 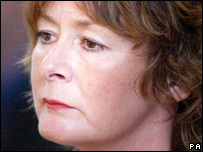 Mr McKie said: "The experience has so put us off that come the 10th anniversary of the Marion Ross case we're finished. "My daughter is not going back to another inquiry to be vilified. "My daughter has spoken the truth from the beginning, but she is still being called a liar." Mr McKie said the family's campaign would end on 9 January, exactly 10 years after the murder investigation began. "If they want a public inquiry we will not participate because we have decided we've got to get on with our lives," he said. "It's been 10 years and there's still not been a public inquiry. My daughter and I need a life."